Do you know Rebecca Katz? What a spicy, fun, adorable, talented, smartie she is. We’re so proud to giveaway a copy of her brand new (fifth?) 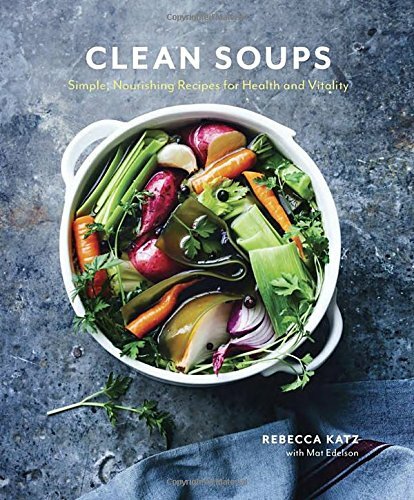 cookbook: Clean Soups. Grace from the lovely state of Virginia won the book! Brought to you by the Bastyr University Bookstore (thanks Marty!) we’re giving away a copy of the festive vegetarian cookbook The Forest Feast. We are honored to feature Rebecca Katz’s latest cookbook, The Longevity Kitchen, for our next giveaway. This fabulous book from colleague extraordinaire has just hit the shelves. It’s timely, well-researched, full of vital information and healing recipes AND we’re giving away a copy! We advocate eating fermented foods as a part of your daily diet on Cookus Interruptus (hence our sourdough bread fundraiser, recipes for sauerkraut and more). Fermentation is a process that uses microscopic organisms to transform food into easily digested, long-lasting, probiotic rich foods. Increasing good bacteria in your diet is important for intestinal health—and a healthy intestinal tract means a healthy immune system, as 70% of our immune system resides in the intestines. Holistic nutritionist and naturopath Deirdre Rawlings, Ph.D., makes incorporating these vital foods into your meals simple and accessible. She does this not only with recipes for relishes, tonics, chutneys, yogurt, kefir and more, but also by clearly outlining these powerful foods work therapeutically. I’m often confounded by the constant bickering between advocates of restrictive diets; each side claiming their way is the right way. Ms. Rawlings supersedes the nutrition rabble babble by cutting to one of chief causes of our ill health – poor gut bacteria – and gives us a toolkit for feeling better. Several of the last few Cookus Interruptus cookbook giveaways have been vegetarian-based. So to keep the score balanced, we’re giving a big yee haw to Lynne Curry’s new hardback book Pure Beef. The Craft of Cooking at Home. Greg Atkinson is so modest (and handsome…). As a chef and writer, Greg truly cares about the source of the food he works with. Having spent time visiting local vineyards and working with local fisherman gives him a seed-to-table perspective that I admire. But according to him, the measure that’s most valuable is the amount of heart that brings people together for a meal. Ain’t that the truth. I saw colleague Kim O’Donnel with a hot off the press copy of this pretty book at a recent gathering and she was clutching it and beaming at it like the newborn creation it is. Kim is the founder of Canning Across America, a collective dedicated to the revival of preserving food. And her latest project is Family Kitchen, a twice-monthly column that appears alternating Wednesdays in USA Today. In our never-ending attempts to please our Cookus audience, we offer a choice of main entrees this week that are both gluten-free and meatless. All three are staple meal entrees in our home. Hope they can be favorites in your home too. Besides learning how to cook three delicious dishes, you’ll find out other stuff about the Cookus family by watching these videos. Answer these three questions in the comment section below and those who give the right answers will automatically enter to win a hardcover copy of The Lost Arts of Hearth and Home: The happy luddite’s guide to domestic self-sufficiency. Ken Albala and Rosanna Nafziger Henderson spread the spirit of antiquated self-sufficiency throughout the household. They offer projects that are decidedly unplugged and a little daring such as how to make acorn crepes, pomegranate molasses, smoked trout and ALSO craft your own soap, broom and a braided rug. There’s not another book like this! 1. What’s the name of the hotel Steve and Cynthia discuss going to? 2. What kind of job does Jane get (for a short period of time…)? 3. Who’s tie does Jane borrow for her work outfit? Remember, you have to be a Cookus Interruptus subscriber to win (home page upper left) . Contest ends Friday October 12 at 5pm. Winner will be contacted soon after (check your email!). Those tiny French lentils become majestic when joined by sage, scallion and currants sauteed in butter then drizzled with Queen Balsamic. Click here for printable recipe. My MOST favorite fall stew. At the peak of early fall fresh corn, dried beans and winter squash emerge together. Collect the harvest of these three sisters and prepare this cinnamon and chili kissed warm stew. Click here for recipe. People who think they dislike tempeh change their minds after tasting this flavorful dish. We usually serve it with a whole grain such as Quinoa . Click here for recipe. Swings…loved going so high you felt like flying, playing frogger, doing crazy flippity dismounts. Now my 4 and 2 year olds spend most of their park time on the swings! Do we have to pick just one…? I loved the pogo stick where I would just hop around all day but also the monkey bars, swings, jump ropes…and the list goes on! Keep moving ladies and gentlemen! Flippety, froggin’ and pogo-in’. And you can purchase Feeding the Young Athlete through Amazon (less than 10 bucks – it’s a virtual steal!). Click here.